From when the Omnibus Appropriations Act of 2018 was signed into law on March 23, 2018 through September 30, 2018, states reported spending 8.1 percent of the $380 million allocated and have outlined plans to significantly increase spending ahead of the 2020 election. Since the initial election reform grants were made in the early 2000s, states and territories report total expenditures of $3,400,037,361, or 85 percent of total federal funds and accrued interest, available under Sections 101, 102 and 251 of HAVA. Washington, D.C. has used $399,400 of its funds to purchase new voting equipment and hire additional staff to increase the number of early voting centers across the District of Columbia, to train election officials and to produce voter education materials. 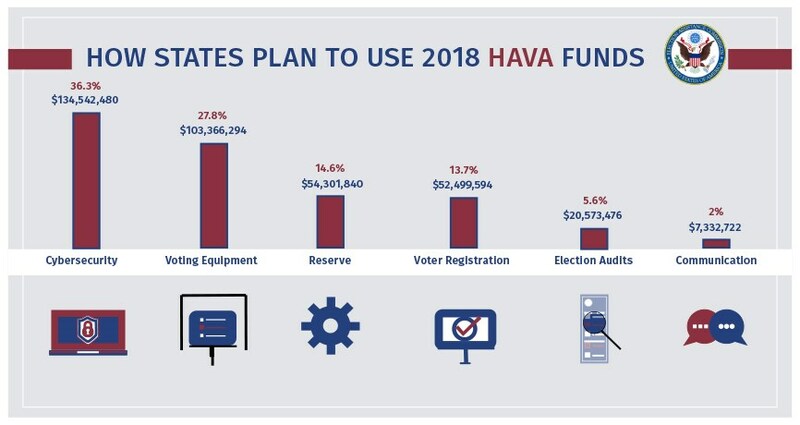 The District of Columbia plans to use its remaining 2018 HAVA Funds to acquire additional equipment, increase maintenance and support, hire a full-time cybersecurity expert, hire and train additional poll workers, continue voter education and outreach, and invest in technology to improve all aspects of voter registration and election administration. Be the first to comment on "EAC Releases First Report on States’ Use of 2018 HAVA Funds"